If a catheter is also placed in the right femoral vein to measure pressures of the right side of the heart, the procedure is called "right heart" catheterization. It may be used in certain cases of significant heart failure or hypotension, constrictive pericarditis, restrictive cardiomyopathy, valvular heart disease, ruptured ventricular septal defect, congenital heart diseases, or when a measurement of the heart output and pulmonary artery and capillary wedge pressures are needed to safely manage the patient during a diagnostic or therapeutic (angioplasty, stent, atherectomy, brachytherapy, etc.) procedure. The left and right coronary arteries arises from the left and right aortic sinus of Valsalva and gives out a series of branches as it makes its way along the surface the heart. 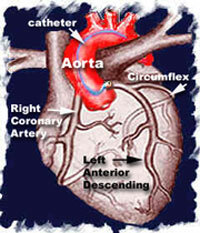 The left main coronary artery, arising from just above the left coronary cusp immediately divides into the left anterior descending (LAD) and the circumflex (Cx) coronary arteries. In some cases, the left coronary artery also gives rise to a third branch that is known as the ramus intermediate or optional diagonal branch. Place your mouse cursor within the picture and move it left and right to pause, rotate and explore the cath lab. ©1999-2004, A.S.M. Systems, Inc. All Rights Reserved, including design, contents, graphics and animations.